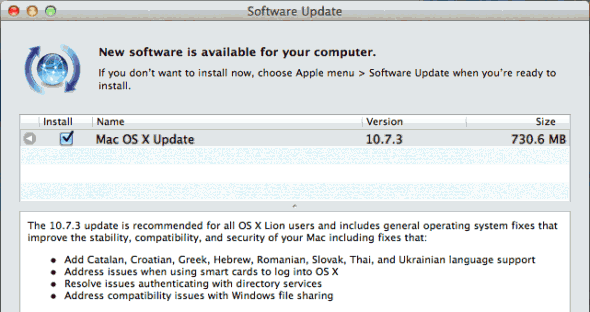 After several weeks of testing, Apple has finally released a software update for systems running Mac OS X Lion, bumping up the version to 10.7.3. The update includes a number of essential fixes and security patches. We particularly note that the update promises to fix Wi-Fi connection issues when waking from sleep, which is something that our MacBook Air (complete review here) has been suffering from. The software also includes a new version of Safari, 5.1.3 and adds additional language support. To check for the update on your Mac OS X Lion computer, click on the ‘Apple’ logo at the top-left, then ‘Software Update’. Be sure to have a recent back up of your system before you install the update (e.g. through Time Machine). It’s a quite weighty download, ours measures 730.6MB. We’ll try to update you once we have a chance to test it out on our devices and if this finally fixes Wi-Fi issues on the MacBook Air. UPDATE: Apple has pulled the standard 10.7.3 update available through ‘Software Update’ as many users have experience issues after installation, such as apps crashing and a weird bug that presents the text ‘CUI’ instead of normal graphics. Apple is recommending all users to use the 10.7.3 Client Combo update, available here. It’s a 1.2GB download and said to fix the aforementioned issues.